I love radishes and pink is my favorite color, so my favorite radish is Heirloom Pink Beauty Radish. Bright pink outside and crisp white inside, with sweet, mild flavor that makes them great in salads. Pink Beauty is a summer type radish can grow 1″ – 1 1/2″ in diameter and are less than a month until harvest. Summer type radish are a great vegetable for the impatient person since they average 21 to 30 days until harvest. And as the bulb is growing, you can harvest the radish greens by just snipping off the larger, outer leaves. These greens are great steamed or boiled. 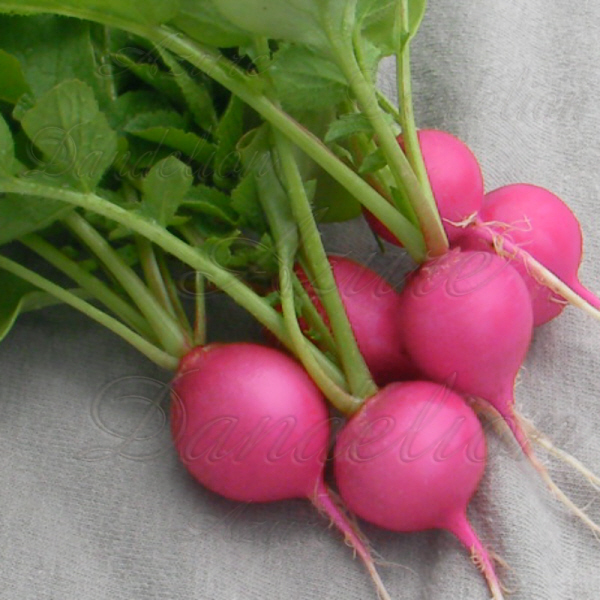 Pink Beauty Radish is so easy to grow so why not try them yourself. Grow your own Pink Beauty Radish with seeds fromAzure Dandelion.